I’m so excited that you have decided to declutter your bathroom! Although bathrooms are the smallest room in the house, they seem to collect the most stuff. I am blessed to have a pretty large bathroom with lots of storage. However, I actually think that having a lot of room for storage gives you unnecessary freedom to keep TOO MUCH STUFF. My goal is to help you get rid of all of the clutter in your home so that you can stop stressing and enjoy life. I was inspired by the Netflix show Tidying Up with Marie Kondo and I will be using some of her techniques adapted to my realistic methods. I am not going to give ideas on cute and clever ways to store your items (although that may come later). I want to help you get rid of everything that you aren’t using so that you don’t have to store much at all. I want to start with an easy area, THE BATHROOM. I think it’s easy because I don’t have a strong emotional attachment to anything there. If you have a large collection of expensive make-up you may feel differently. Just try to keep the goal in mind of getting rid of everything that you aren’t using. Below are some common items that are often stored in the bathroom but could be stored in another area of your home. As you begin to sort through items I would suggest having a trash can, a keep bin, a donate bin, a sell bin, and an undecided bin. Don’t put anything back into a cabinet or drawer until you have completely sorted everything. I have found that sometimes I put too much in the keep bin and I sort through it a second time to get rid of more. Once it is put away you won’t be as willing to take it out again to get rid of it. You don’t need to go out and buy bins for sorting. I used some plastic bins that I was using to store some items in a closet. You could also save boxes or ask if a friend has any boxes that they could give you. Laundry baskets also work great for sorting. I started with the small trash can that is already in the bathroom thinking that I didn’t have that much to throw away. I filled it in the first 10 minutes, so I moved in a larger trash can. I ended up filling two large kitchen trash bags with expired medicine, old lotion, old makeup, etc. Do I use this? Not will I use this, that question will cause you to keep everything. Would I buy this today? Our taste in color, decor, and style changes constantly. If you wouldn’t buy it today you probably won’t use it tomorrow. Does this bring me joy? This is where Marie Kondo’s method comes into play. If an item brings you joy or makes your life easier or better, keep it! The goal is not to live in a home that feels more like a hotel room. The goal is to get rid of the clutter that is causing stress and getting in the way of life. Do I have multiples of this? Can you donate the multiples if they will expire before you can use them? Do you have a separate storage space to keep the multiples? This is a difficult one for me because we are preppers, so we have multiples of a lot of things. However, we have a separate storage area for the items that we buy in bulk and use on a regular basis. Can this be combined or reduced? Can you combine 3 bottles of lotion into 1? Can you take the item out of its packaging so that it takes up less space? Medication/First Aid. First, check the expiration dates on everything and throw it away if it’s expired. Next, look at what you have and decide if you still need for it. Continue to sort through your medication and first aid supplies until you are left with only what you are using. 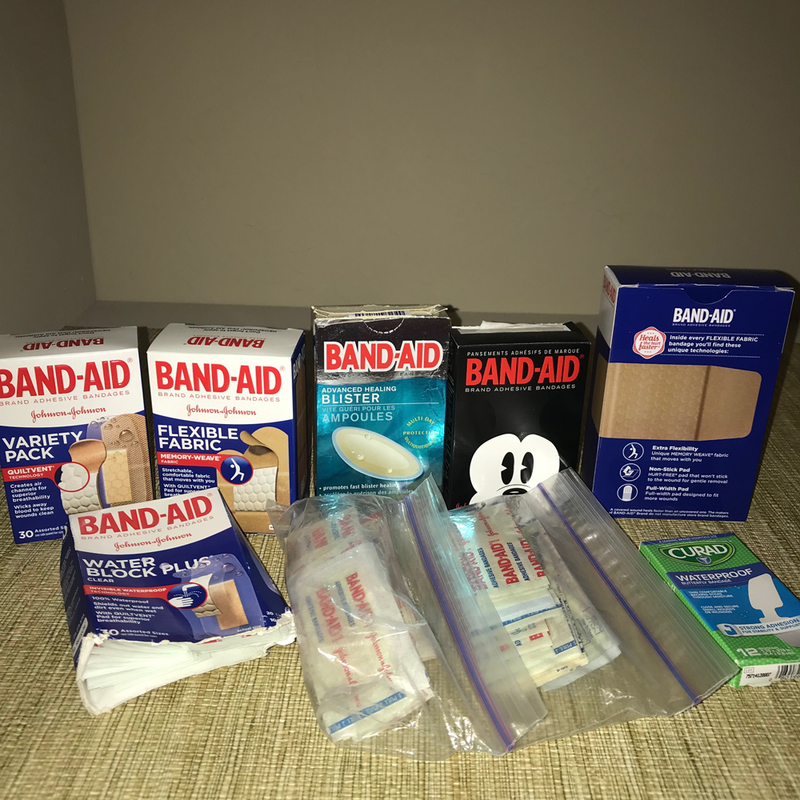 I have five boxes of band-aids that I hope I will never need to use. I condensed what I could fit into one box and donated the rest. Medication is one of the items that you could consider moving to another location. If your bathroom gets really steamy when you shower, then it is not the ideal place to store medication. Move it to a cabinet or drawer in the kitchen instead. Cosmetics. First, throw away anything that is old. Below is a graphic that should help. If you can’t remember when you got it, but you don’t really use it, throw it away. I had a bunch of lipstick and little sample compacts of eye shadow from Clinique. I only kept four and threw the others away. 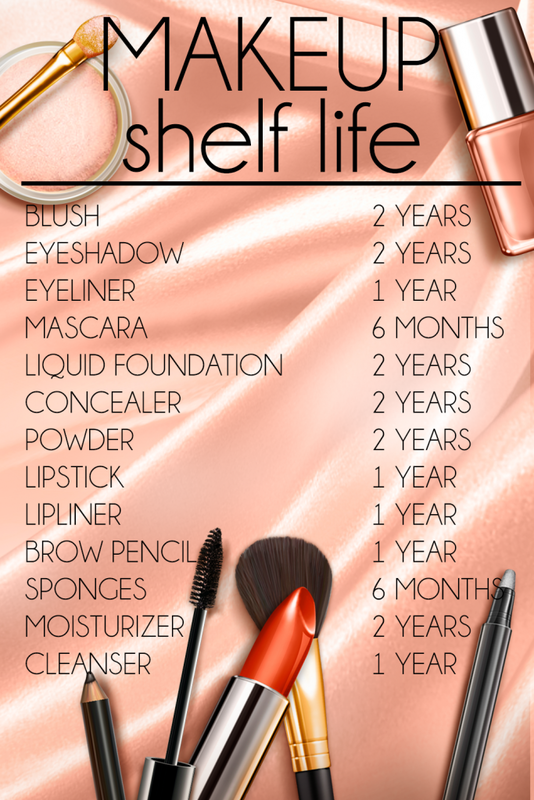 I only wear makeup once or twice a week, so those should last until it’s time to throw them away because they are old. Soap, Lotion, Hair Products. Again, throw away anything that is old. Next, combine like products into one bottle. For some reason my husband had five partial bottles of lotion in different areas of the bathroom. I didn’t question it, I just combined them. I have to confess that I had 3 cans of hairspray. Since I can’t combine them I put the one with the least amount in my drawer to use first. I used to bring home the small bottles of shampoo, conditioner and lotion from every hotel room we stayed in. But I never used them. I don’t bring them home anymore because I got tired of storing them. I donated all of the ones that I had. There were some bottles of lotion and some cologne and perfume that we don’t like the smell of anymore. I put those in the sell bin because I felt weird about donating partially used bottles. 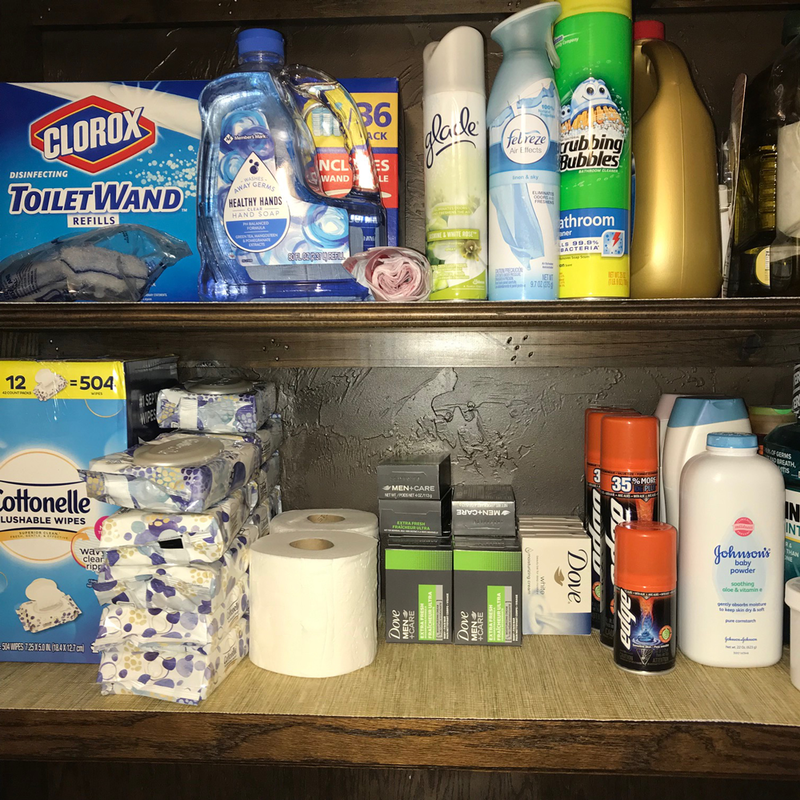 We buy in bulk, so I had several bottles of soap and deodorant that I moved to the cabinet above the toilet. I designated that our overflow shelf. Skin Care Products. I am notorious for trying to “next great wrinkle cream” and other miracle products. I’m not going to lie, this one hurt. That stuff is expensive! I decided if I’m not using it now, I’m not going to start. So I threw a bunch of creams away. I’m sticking with a moisturizer enhanced with essential oils. The second best part about taking these drastic measures to get rid of clutter is that you will think twice before you make your next purchase, thus saving you money. Obviously the best part is seeing how clean and neat your bathroom is. Nail Care Products. I didn’t have much I needed to get rid of because I don’t polish my nails often. After you have thrown away old polish and colors that you would no longer wear, determine what size container you need to store the rest. Throw away old files and other tools. Then store all of your nail care products in the same container. 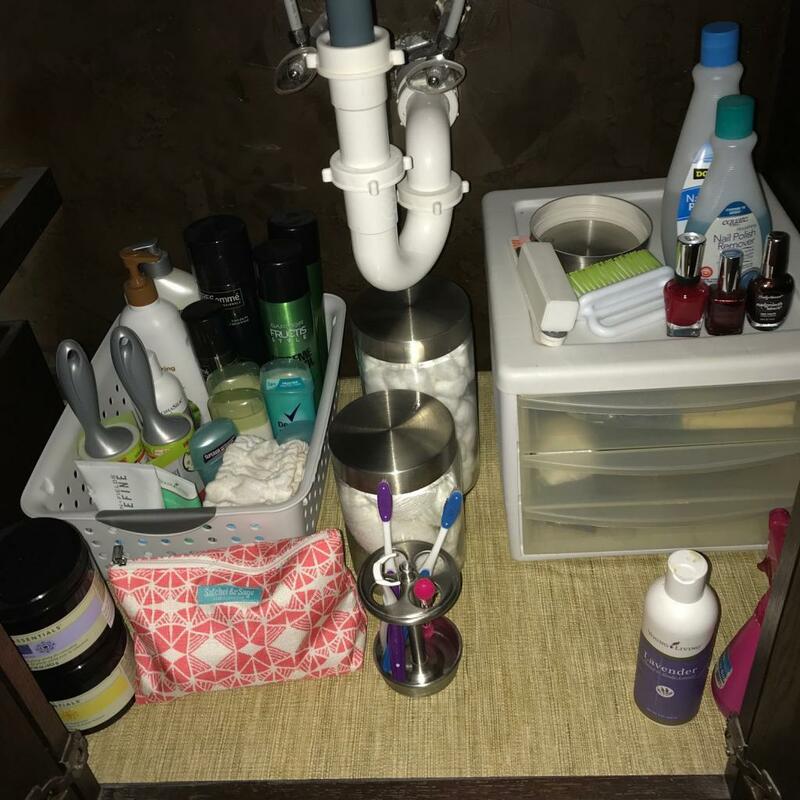 I had so few items I was able to put them on top of a three drawer organizer under my sink. Brushes/Combs/Accessories. I threw away several combs and a brush because I have my favorite that I use every day. I donated a bunch of hair clips and ponytail bands from my days of long hair. Remember to ask yourself the 5 questions to determine whether you should keep it or toss it. Shaving/Hair Removal. This was a big one for us. My husband is bald by choice which means he has to shave regularly. He is constantly trying to find the best and most economical way to keep his head smooth. We had five electric shavers, tons of cheap disposable razors, and several reusable razors. This is where the bulk of my donate items came from. Throw away what you aren’t using. Combine what you are. And encourage your husband to stop searching for a better way (wink). Beauty Appliances. This is your chance to get rid of old hair dryers, curling irons, and straighteners that you aren’t using. I had two curling irons and my hair hasn’t been long enough to curl for years! I also had a nail care system that I don’t think I ever used and I can’t even remember when I got it. The sad part about a lot of what I chose to donate and sell was that I have packed them up and moved them several times. I found accessories to a foot bath that I think is upstairs in a box. I put them in the sell bin to see if I could reunite them to complete the set. Towels. Decide how many towels your family needs and donate the rest. If they are too ragged to donate to the less fortunate you could donate them to your local animal shelter. I actually hung onto a few that were not as fluffy as they used to be but still usable. They will be sent with our son when he moves out after graduation. Because let’s face it, he’s probably not going to do laundry very often so he’s going to need quite a few towels. We don’t use washcloths but I had several from sets of towels. I donated all of the washcloths and only kept a few of the hand towels. Cleaning Supplies. 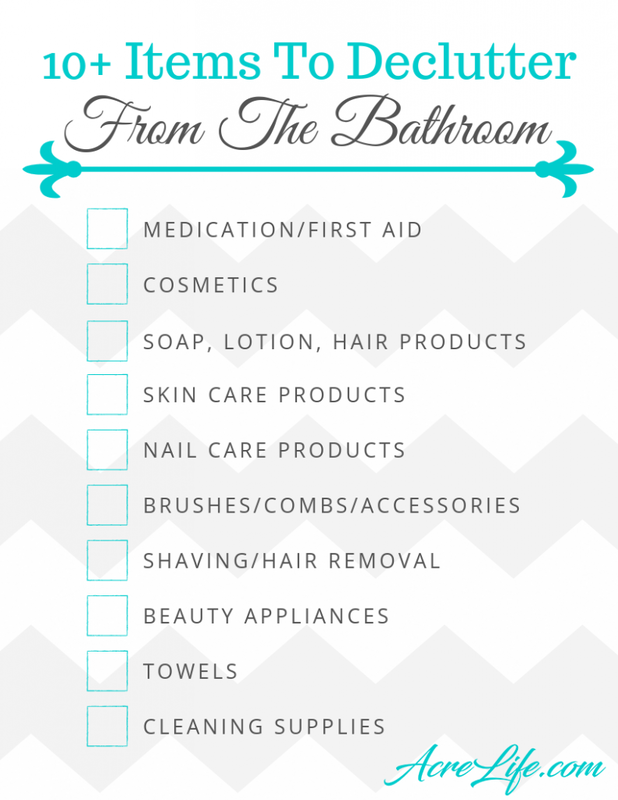 Chances are you only keep the cleaning supplies that are specific to the bathroom actually in the bathroom. Throw away anything that you don’t use and combine any that you can. My goal is to use what I have and then switch to Thieves Cleaner. I use Thieves Cleaner in the kitchen and I love it! I used to use Clorox wipes all over the house but the smell of them is too harsh. After you have sorted everything in your bathroom, remove the trash first. Then remove the donate and sell bins. Now you have a clear idea of what you have decided to keep. Look over it again and make sure that you are still happy with your decisions. I actually removed some of the items that I thought I wanted to keep at the beginning of the process. There is such a liberating feeling when you get rid of excess clutter. I took the donate items directly to my car so that they didn’t clutter some other area of the house. Begin to group what you are keeping and put things where they make the most sense. If you are like me, you put things where there is space rather than where it make sense. Don’t feel like you need to fill every inch of your cabinet or drawer. Leave some space so that your items are easier to see. I bought a few new organizers and borrowed some from other places in the house. I hope that I have taken all of the guess-work out of decluttering your bathroom. Download the checklist below and get your bins and trash can ready! Click on the links below to tackle each area of your house. I am writing these as I tackle them in my own house so check back often to find new areas to declutter.